Two platoons of Timorese army deployed in Bobonaro and Kovalima Timor Post, February 11, 2010 language source: Tetun The Timorese Defense Force (F-FDTL) Commander, Major General Taur Matan Ruak, has announced that the Timorese army has deployed two platoons of the national army in Bobonaro and Kovalima districts. General Ruak said two hundred of the army officers been deployed in the Bobonaro and Kovalima districts to support the national police to hunt down local ninja gangs. General Ruak added that he hopes the army’s presence will have some success in reducing the amount of crime in the area. Meanwhile, the Timorese Police Commander, Commissary Longuinhos Monteiro, has welcomed the army’s move into the area. He also added that the national police had detained 39 people during the operation. Commissary Monteiro says the people in detention were members of the Timorese ex-resistance organizations CDP-RDTL and Bua-Malus. National Army soldiers sent to stop ninja gang violence Radio & Televizaun Timor-Leste, February 10, 2010 language source: Tetun The national army commander, Major General Taur Matan Ruak, has announced that he has sent two platoons of his soldiers to the areas which are at high risk of ninja gang activities. Mr. Ruak says that objective of sending the soldiers is to reduce fear amongst local residents after a rise in gang crime. Mr. Ruak made the comments following a meeting with President Jose Ramos Horta at the Presidental Palace yesterday. Mr. Ruak stressed that the ongoing operations led by the National Police in the area have been successful, therefore the role of the army will be to help local authorities to pass on information about the security situation and also to take part in some social programs within the community. He added that security situation is now calm, but there is still some concern in some remote areas. The commander has promised that the security forces will come to these areas soon to maintain peace. 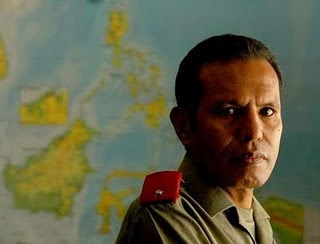 Image added by ETLJB: Timor Armed Forces Chief Taur Matan Ruak: Fails to comprehend the constitutional role of the armed forces in East Timor.